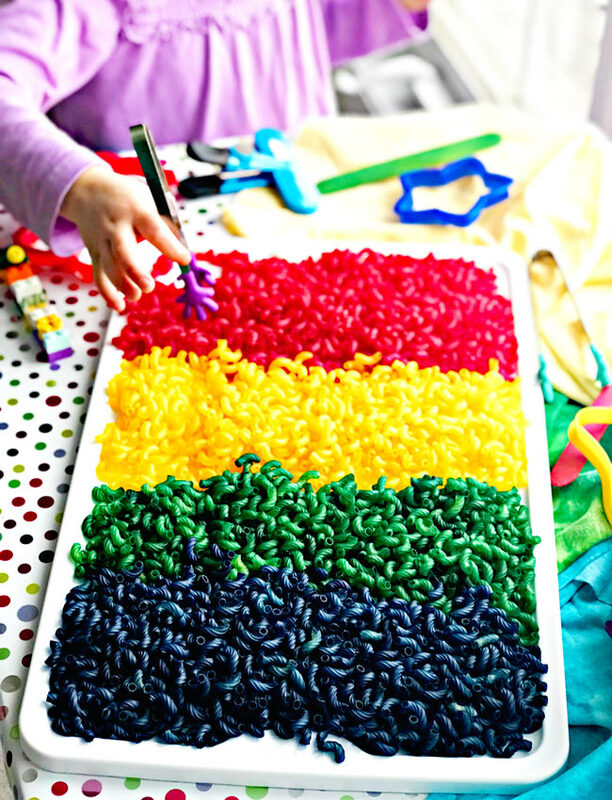 If you are wondering how to dye pasta for sensory play, then look no further! 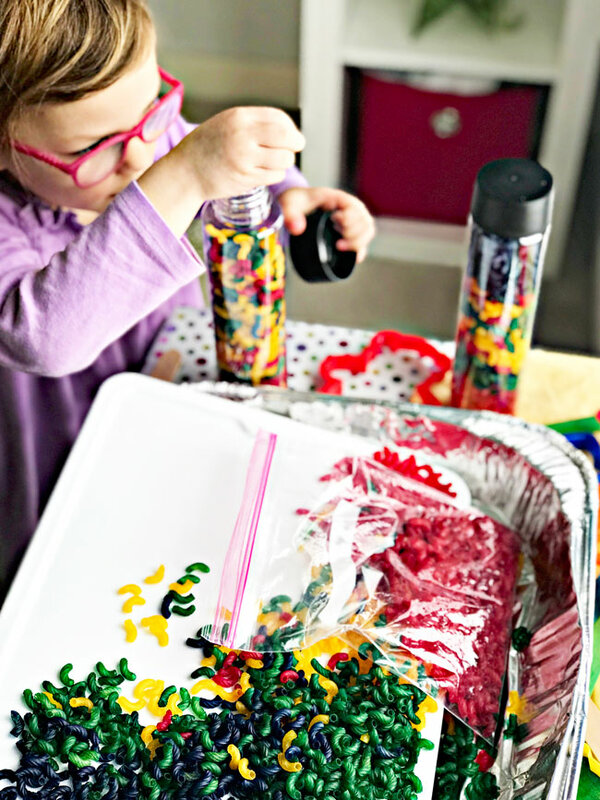 This simple recipe takes just minutes to make for hours of fun and is the perfect hands-on activity for kids of all ages. This sensory play pasta recipe also happens to be gluten-free! After we made our Rainbow Rice recipe, I knew I wanted to try the same process with gluten-free pasta. And I’m here to tell you, the results did not disappoint. 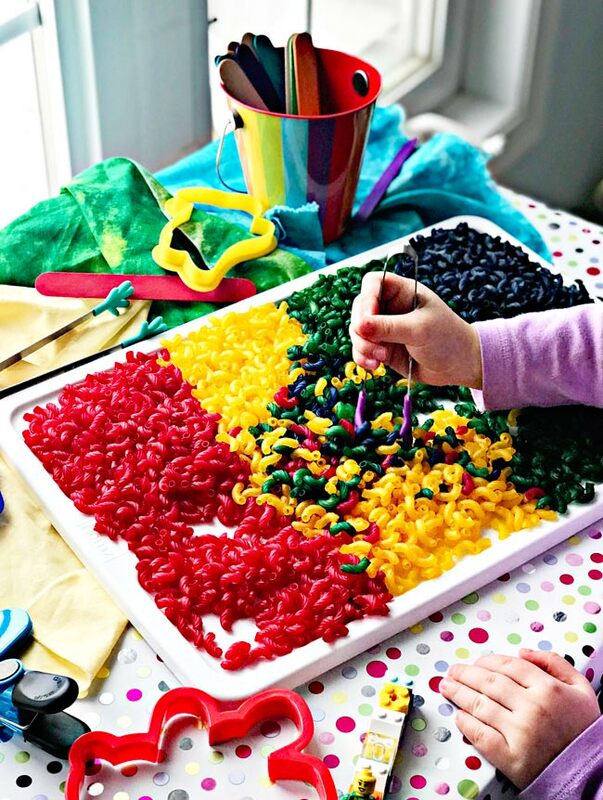 If you are stuck indoors, overcome with cabin fever, and ready for a stimulating activity that will keep kids busy without tv, then it’s time to make your own colored pasta for sensory play. The options for entertainment are endless, and the colors are vibrant. Those last two elements, open-ended play and vibrant colors, seem to be dealbreakers for Toodle and Twinkle. They like to run with their ideas, and sensory play activities allow them that opportunity. 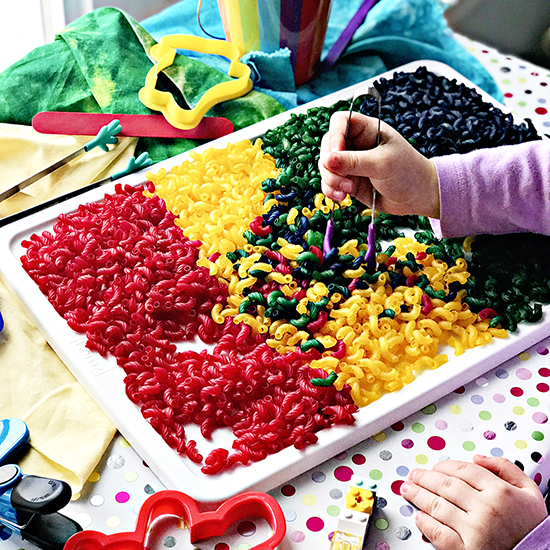 Playing with pasta and other sensory activities also means they play on their own without tv. Independent play without the need for media? I’m all in for sensory play if that’s the result. Pour the pasta into the bowls and baggies/containers. Squirt the liquid watercolors into the pasta. Knead the pasta in the baggie so the color mixes but the pasta doesn’t clump. The whole process takes about five whopping minutes, which is perfect for busy hands and short attention spans. 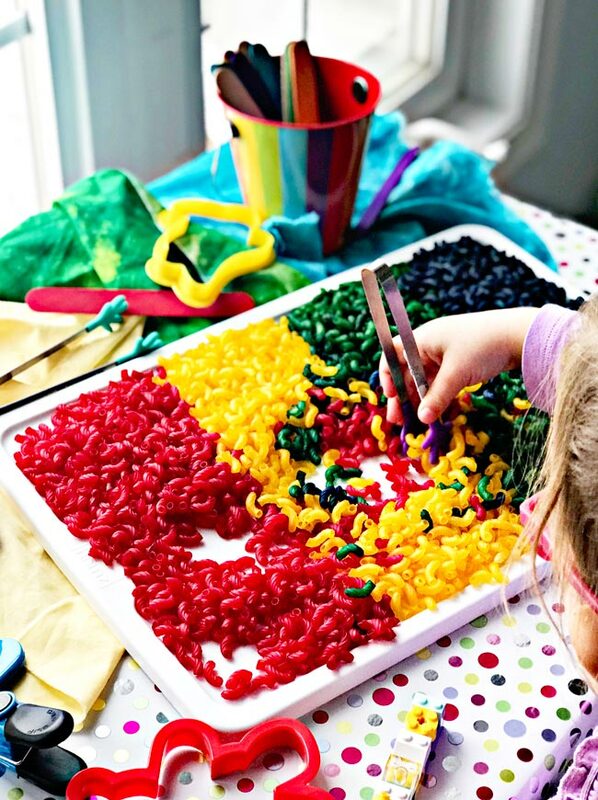 And dyeing pasta for sensory play is perfect for kids who like hands-on activities but aren’t quite ready for complex building activities that might otherwise frustrate them. It’s also an activity that kids of all ages can engage in together at the same time! Toodle is nine and uses the pasta much differently than Twinkle who is five. And because pasta is relatively cheap, we can make a large batch for both girls to enjoy without breaking the bank. Who doesn’t love to challenge and stimulate young minds without spending beaucoup dollars? If this is all sounding rather awesome, then grab some pasta, a few bowls, and liquid watercolors, and let’s get started! Below are the ingredients you will need to dye pasta for sensory play. Uncooked pasta. We buy boxed gluten-free pasta, which has a yellow color because it’s corn-based. This DOES alter the color options. See COLOR NOTES below for additional details. Liquid watercolors. I love using liquid watercolors because while they adhere to the pasta quite well, they don’t permanently stain skin or clothing. Bowls and spoons. It takes just a matter of seconds to stir the pasta and liquid watercolors together. Plastic baggies (optional). While we try to reduce our carbon footprint, baggies (or some kind of long-term storage solution) are helpful here. After stirring the pasta and liquid watercolors together, I then transfer the pasta to the baggies and leave them open to dry. Surprisingly, the liquid watercolors didn’t stain the baggies, so I saved them for future creative uses. 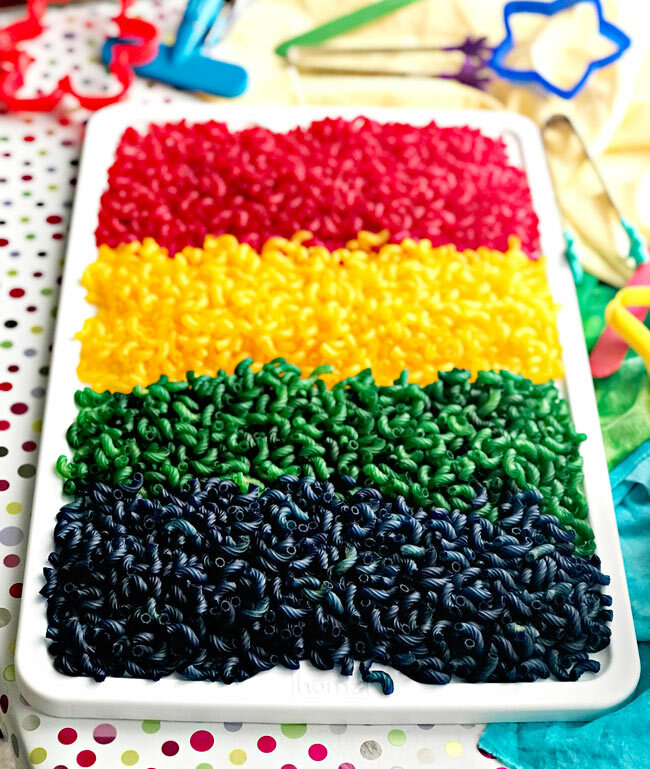 Below are the steps for how to dye pasta for sensory play! They’re simple, easy, and quick! Measure about 1 1/2 – 2 cups pasta for each color you want to make. Pour the pasta into a mixing bowl. Using a 1 :1 ratio of pasta to bowls for each color you want to make, repeat this process until all colors are accounted for. If you don’t have enough bowls for the colors you want to make, don’t worry. Liquid watercolors rinse out easily so you can reuse bowls for other colors. Add about 1 1/2-2 tablespoons liquid watercolors to each bowl. Add more for deeper colors. Stir the pasta and liquid watercolors together, scraping the bowl, until evenly combined. Transfer the pasta to containers for storage. Baggies work well because you can knead the pasta so the colors mix with the pasta without the pasta permanently clumping. Store in desired open container and let dry overnight. Then get ready to play the next day! Jars, bottles, or pails for filling and pouring. String or pipe cleaners for threading. Tweezers and clothespins for picking up, fine motor skill development, and hand-eye coordination. Wood sticks and cookie cutters for imaginative play. Egg cartons, small dishes, or small produce containers for pouring, filling, and transporting. Roasting pans, pie pans, or metal tins for playing with large batches. Large, shallow tubs to pour multiple batches into, especially for rainbow effects. Because we use corn-based gluten-free pasta that is yellow, our color options are quite specific. If you use liquid watercolors to dye corn-based gluten-free pasta, you will have vibrant reds, blues, and greens. You can also combine blue and green for a deep turquoise color. If you are wondering how to dye pasta black for sensory play, then look no further than purple liquid watercolors. The more you add, the darker and deeper the color will be, eventually turning black. If you want purple gluten-free pasta using liquid watercolors, add small amounts of liquid watercolors at a time. You can also experiment with red liquid watercolors, adding a bit of water to dilute the color. Depending on the shade of pasta, you may end up with a reddish-purplish pasta color. When you mix yellow or orange liquid watercolors with corn-based gluten-free pasta, you end up with vibrant, almost neon, colors. The yellow will blend with the already-yellow pasta. But the color will be stronger. Orange in this recipe is quite strong, and you can probably get away with using a little less liquid watercolor than you would with other colors. Pastels are hard to achieve with primary and secondary color liquid watercolors and gluten-free pasta. We thought the results were “meh” so we’re exploring other options for additional color choices with gluten-free pasta. 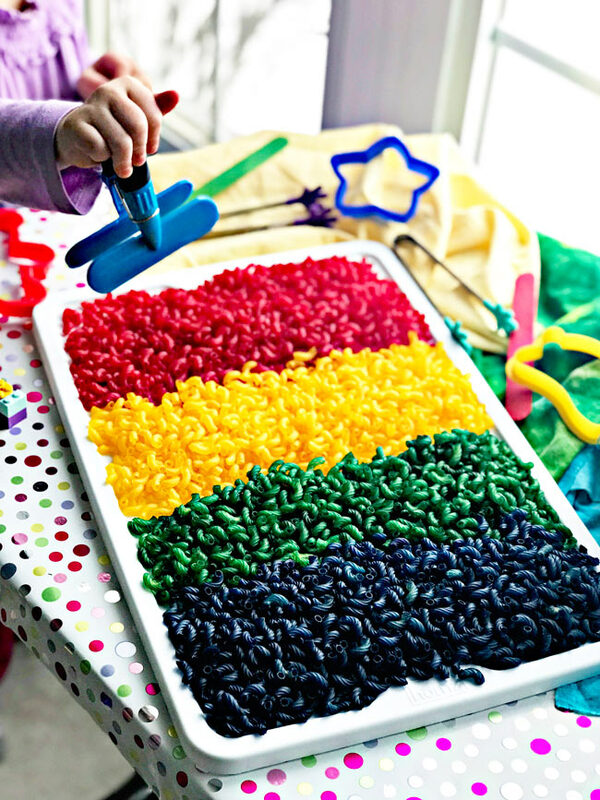 And now you have your very own batch of dyed pasta for sensory play! And when stored in an airtight container, your pasta should last several months for unlimited amounts of play! Measure about 1 1/2 – 2 cups pasta for each color you want to make. Pour the pasta into a mixing bowl. Using a 1 :1 ratio of pasta to bowls for each color, repeat this process until all colors are accounted for. Transfer the pasta to containers for storage. Store in desired open container and let dry overnight. Break up pasta by hand if it clumps together during the drying process.